As a kid, black tea was the standard. It was always served hot with some mint or sage. It was later on as I grew older that I started to explore other types of tea, green, white, flavored or infused. I have seasonal favorites, morrocan mint green tea being on top of that list, Earl Gray and jasmine are on that list too but I always come back to a perfectly brewed cup of black tea. One summer, one of my mum’s best friends introduced me to Adani tea شاي عدني which is a popular drink served in Yemen. It is basically a blend of spices that is boiled with tea and milk to yield an aromatic and refreshing drink. The spice blends vary with key players like cardamom, cloves and cinnamon. I know the idea of a hot drink that is composed of milk, spices and tea might sound odd but this is one drink that you have to try to appreciate and trust me when you do, you will not only appreciate it, you will fall in love with it down to the very last drop. That is why when I saw this recipe for a spicy Chai concentrate on Victoria’s blog , I could not wait to give it a try and it did not disappoint. Place the water,spices and tea in a pot and stir to dissolve the sugar. Lower heat and cover the pot then simmer gently for 20 minutes. Remove from heat and add honey and vanilla. Strain and store in the refrigerator in a glass jar. The honey and vanilla are optional additions. you can omit them but they do add a pleasant flavor. If you are not familiar with star anaise taste or not very fond of it, make the recipe without it. My husband likes it better without the anaise. Posted in Drinks, Hot drinks, Vegetarian and tagged adani tea, breakfast, chai concentrate, english breakfast tea, spice blends, spice tea concentrate, vegetarian, شاي عدني. Bookmark the permalink. Marvelous, marvelous, marvelous!!!! I can just smell the beautiful aromatic flavors brewing! I love chai anytime of the day. I guess, that’ s how it is in India. I love the combination of spices used here. Your chai looks like the perfect afternoon pick me up. Would love some right now. Once you’ve got the concentrate in the fridge do you reheat it and add some milk to thin it out. Or do you dilute it with some cold water? In what proportion of concentrate to ‘whatever’ do you drink this as I’m unclear? That looks like a very nice recipe! It made me crave for some chai tea latte from Starbucks! Black tea is also a standard drink for Turkish people. We call it Chai. It’s a great informative article about different teas all around the world, thank you for sharing, sweetie. Growing up tea was always part of our dinner. As dinner was coming close to being at the end, my dad would point to one of us kids and ask us to start the tea kettle. We grew up with Red Rose tea ~ A Canadian brand of tea. It was after I moved away from home that I started branching out in my tea… white, green, red…. 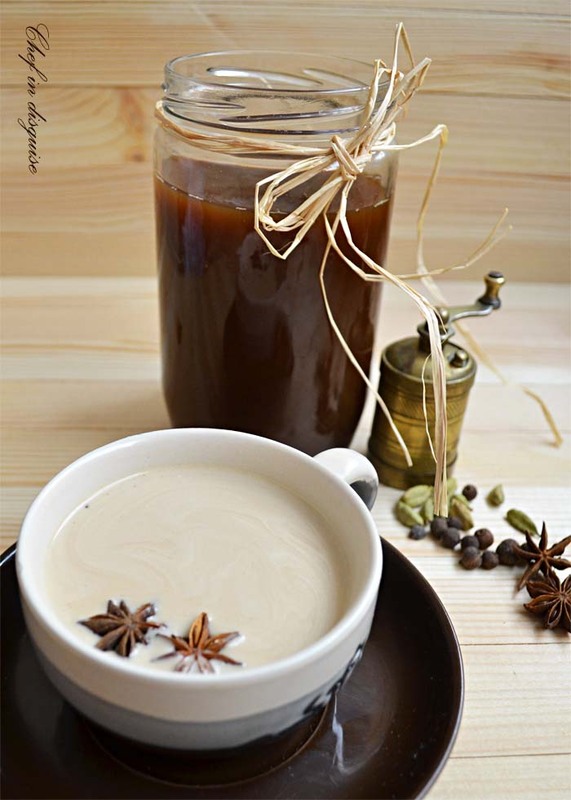 I love chai, it is probably one of my favorite blends of tea… Sweet and spice with a touch of milk (I don’t drink milk in any other tea but chai) ~~ I love to use french vanilla tea. I will be trying this recipe as soon as I buy some cinnamon stick and see if I can find allspice berries. I pinned it so that I will have it when I get all the ingredients. Thanks for sharing. I just had a masala chai…I love it too:) Your picture set up is so perfect!! Love it! I think the tea your son is talking about is the adani tea. To make that tea you need to boil 3 cups water with 3-4 cardamom pods that you have slightly crushed, 3 cloves and 1 cinnamon stick and 3-4 pods all spice then you add evaporated milk and allow it to simmer for a couple of minutes then take off the heat, add the tea and cover the pot and leave it for 5 minutes. I am going to try this. Bookmarking it. Oh I love Chia! Reminds me of happy days travelling around India, and supping on warm, sweet, mily and aromatic tea – perfect as a pick me up after a long dusty journey, or a warmer on a cool evening…….aaahhhhh happy memories, and a lovely recipe ! I wish I would have been exposed to more selections of tea too, Sawsan. Now I have so much fun exploring new flavors with black tea being one of my favorites. I’m going to save this recipe in hopes that I will someday stash some in the fridge. You are most welcome Louise. If you enjoy exploring new flavors with black tea, I think you will love this one. I love chai tea and have been meaning to make a concentrated syrup for ages. Maybe I’ll make this one 🙂 Your photos are making me wish I had a mug of it right now! I loved having the tea concentrate around Korena, you can have it in so many ways. This is really incredible. I’m not a big tea drinker but this is changing my tune. Looks great, will try that soon. When I saw your favorites they struck a note with me. My usual morning ‘blend’ is a mix of earl grey and a bit less of jasmine loose tea with lots of fresh mint on top. I remove the mint and then add more of it all later on. I also make it and then put it in a container for iced tea. Growing up, yours was a tea household; mine was coffee. I’ve never grown to like tea but, then again, what passes for tea here is a far cry from the teas you’ve enjoyed and described here. This chai concentrate sounds incredible, Sawsan, and has me seriously considering making some. It’s the list of ingredients. They sound fantastic! Just a couple of weeks ago I went to a food show and tried a tea which was very much like what you have descibed. They were selling it in sachets with the milk and sweetness already in there. We just added water and it tasted delicious, which is saying something for someone who drinks tea black with no sugar. I must print this out and make it for us. OH, Sawsan, I am so very glad you tried the concentrate. Isn’t it wonderful? Hot or cold. With milk or without. And the way you displayed it is just gorgeous. Thanks for linking to my blog–I sincerely appreciate it. Great post–I’ll look up adani tea and see what I find. I love variations! Its the same with us Indians. We ove our tea in breakfast and after noon and this is one common beverage that is served for guests. But Sawson one thing is for sure that I have never drank such spicy concoction. I am intrigued to taste the tea. I’ve made Chai Tea, but not in the quantity that you’ve done here! What a great idea, you can have Chai on any day… just so simply!! I miss having Chai, we tend to drink it here more often in winter, but I may just have to make a cup tomorrow!! Beautiful photography as well, Sawsan!! oh we in india.. also love our tea with mlik and a whole lot of spices and diabetically sweet!! 🙂 we call it masala chai.. and you vary the spices according to your taste.. if you like more of caradmom.. or more of ginger when you ahve bad cold/cough!! but this recipe that you have posted.. is quite interesting.. it has vanilla, orange zest, star anise…should be very interesting!!! Oh i love tea! I have had arabic “qahwa” before and it was a little too strong for me. But, this is so different and there are so many aromatic sices incorporated that i simply must try this!!! We adore chai tea but I will only make it at home, the Starbucks variety us very calorie heavy (I’ve heard as much as 1500!). I’m intrigued that there are pepper corns in this blend, I love a peppery taste. I was going to ask you about the simmering and if it’s bitter; it’s interesting that baking soda counter acts this. I’m going to keep that in mind, thank you. Oops — I forgot to say, “Plunk the tea bags in, REMOVE THE PAN FROM THE HEAT, and steep covered. I discovered black tea with sage in some research I was doing last year. I tried it and have made it many, many times! Hot chai is the traditional afternoon tea in this house during the winter time. I always go the lazy way out and just use teabags, but I love this concentrate! I can easily see it for a cold chai as well. Thanks for this idea and for this wonderful recipe! Chai is the best! We drink lots of tea for breakfast (instead of coffee), though rarely turn it into the deliciousness that is chai. Great combo of spices, flavors – thanks for this. I love the idea of making a concentrate at home. It’s so convenient, especially for an avid tea drinker! Love your combination of flavours. What an absolutely lovely sounding recipe for Chai. I adore Chai and desperately wish we could share a cup together…albeit cold with the crushed ice you mentioned. It’s been crazy hot here. Have a beautiful weekend Sawsan. No harm in wishing, right? Sawsan, I’m seriously wishing I had some chai tea made from your recipe RIGHT NOW!!! There’s no doubt it my mind that it will be many time better than anything I could buy in tea bags. Thank you! 🙂 I’m updating my spice collection on the very next shopping trip! Wow … This sounds ah-mazing!! 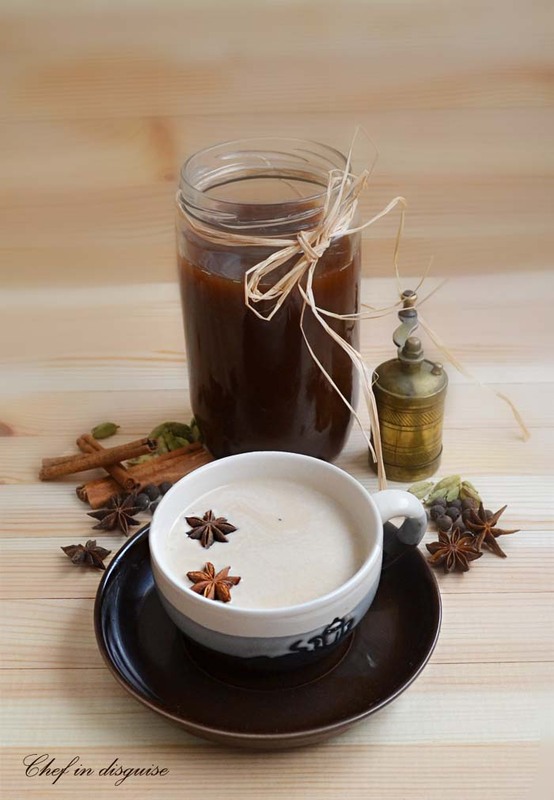 How delicious, I love chai and I know this is incredible with all of those fragrant spices! I know what you mean abou the sweet chai products. I can’t stand them either. There is a yamani tea called adani tea that is make with evaporated milk that is simmered with tea and spices, the smell is aromatherapy and the taste is heavenly!